Located in the heart of Burnaby, on Canada Way at Edmonds Street, AgeCare Harmony Court Estate is close to all conveniences, including public transit. It’s also next door to the AgeCare Harmony Court Care Centre, forming a “campus of care” that enables aging in place as your needs change. The 1st floor is the Memory Care floor whereas the 2nd floor is for 24 hour residential care. In this retirement community, residents become neighbours and neighbours become friends as they take advantage of the many activities, events and gathering places in the residence. At AgeCare Harmony Court Estate we believe in offering you as many retirement living options as possible for worry-free living in a friendly, caring, safe and secure environment. 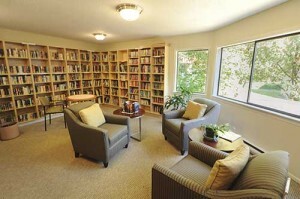 The unique design of the community lends itself to an intimate and welcoming retirement lifestyle. Relax and socialize in the Fireside Lounge with complimentary coffee and tea throughout the day, puzzle table and a resident computer. Participate in the many community activities in the Garden Room, with its bright conservatory, dance floor, and outdoor courtyard patio. Entertain or be entertained in the Games Room with billiards table and big-screen TV. Invite your friends and family to a private gathering in the Country Kitchen; rent-able with complete full appliances and mountain view. Stay fit in our full service fitness centre open 8am till 4pm. Read and unwind in our Library with a wide range of 2000+ books and magazines. Enjoy the professionally landscaped grounds featuring two courtyards and walking paths. Treat yourself to a visit to the on-site beauty salon/barber shop. Join in the fun. Our Activity Room offers, Bingo, Wii bowling, painting classes, armchair travel, movie night, Osteo Fit, Yoga in a chair, etc. Our community is fully wheelchair accessible in the common areas, with two elevators and we offer complimentary parking to the guests. Pets are welcome, too!